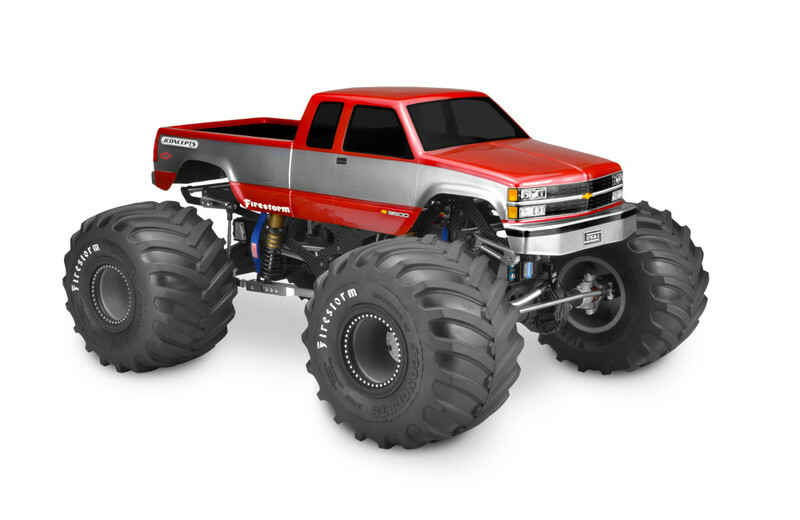 JConcepts is on top of the best monster truck body styles in the business with the release of the 1988 Chevy Silverado. The 1988 styling is very clean, updated, refined and didn’t display the boxy looks from the early 80’s. The fleetside, extended cab design is spot-on featuring slight curvature to the main shape, new headlights, grille treatment and form-fitting wheel wells. The slight flare to the tire openings give just a little wrinkle to the bed-sides and front fenders to accommodate different sized tires for maximum versatility. The JConcepts body includes a decal sheet that makes detailing out the headlights, taillights and grille a breeze while window mask allows the user to quickly get the body into paint. The extended cab body has an 13” wheelbase and fits retro and race monster trucks as a drop-on giving the all important clearance and functionality. This product was added to our catalog on 06/10/2017.